If you are like me, you have cucumbers coming in, and you’re wondering what you are going to do with all of them! 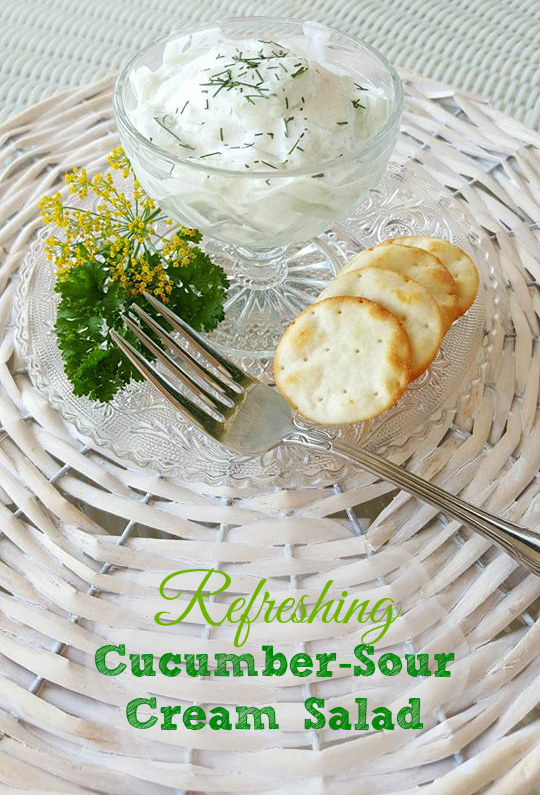 I wanted to share an easy and refreshing Cucumber-sour cream salad recipe with you. This dish is great by itself, enjoyed with your favorite cracker, or as a side dish with a lunch or dinner entree. The salad is also delicious, simply served over a bed of lettuce and tomato, because as you know, tomatoes are in season right now! Slice cucumbers very thin. Place in a glass or china bowl. Add vinegar and sprinkle with salt. Let stand one hour. Drain. Mix with sour cream. At this point, I also add my freshly chopped dill.